It was as the artist for the Eagle comic's Adventures Of PC 49 (below) in the 1950s that John Godfrey Bernard Worsley, who died aged 81, really reached an audience. From his first episode, published in August 1951, he drew the tales of 49 - Archibald Berkeley-Willoughby - until March 1957. Some 290 episodes, involving more than 3,000 drawings, appeared in Eagle comic alone, with further tales in the Eagle Annual and various spin-off books. Three-quarters of a million schoolboys relished every brushstroke each week. Worsley also worked for the Eagle's companion paper, Girl, drawing Belle Of The Ballet, and, beyond that, turned his talent to an extraordinary range of work. This included Albert RN, the dummy sailor at the centre of a daring wartime escape plan from Marlag O prisoner-of-war camp, near Bremen. Worsley, himself a sailor PoW at the camp, created the life-sized figure out of wire and papier-mache, after which it was held between two soldiers during roll call, fooling the camp guards into thinking they had a full complement of prisoners while a British escaper made his getaway. For four days, Albert, with his ping-pong ball eyes and no hands (his sleeves were stuffed into his jacket pockets), stayed on parade; unfortunately, the escaper was recaptured on the northern coast of Germany. Two months later, Albert was finally rumbled when a second escape attempt was foiled, and the camp guards realised they had one too many prisoners. Back in England, Guy Morgan, a former fellow PoW, immortalised Albert RN in a play, which, in 1953, became a film starring Anthony Steel as a fictionalised version of Worsley. The artist himself recreated Albert for the movie, and the dummy is now kept at the Royal Naval Museum, Portsmouth. Born in Liverpool, Worsley was the son of a naval officer who settled on the family coffee farm at Kabuka, north of the Kenyan capital, Nairobi. It was here, amid spectacular scenery and at an altitude of 6000ft, that Worsley grew up, shooting and messing around in the family model-T Ford when not attending school. This idyllic life ended in 1928, as coffee prices collapsed. John was sent to St Winifred's boarding school, his fees subsidised by the Royal Navy Trust. He won a scholarship to Brighton College, and spent three years at Goldsmiths College school of art. 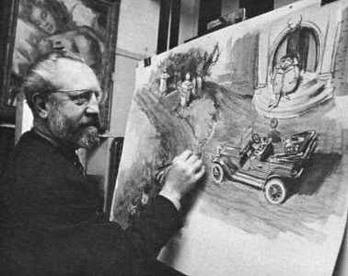 In his final year, he purchased a second-hand Fiat for £4, and, after leaving college, travelled the south coast, making sketches to sell to magazines. Worsley's naval experiences began in 1939, with a three-week crash course in seamanship. His ability to accurately report through his work helped him to become the youngest official war artist in the Mediterranean. He had already survived the sinking of HMS Laurentic, by a German U-boat in 1940, and now found himself taking part in the landings at Sicily, Reggio and Salermo. In 1943, he was among the rescue party sent to establish a base on Lussin Piccola, in the north Adriatic, only to find it overrun by Germans. Worsley was taken to Germany for interrogation, and spent almost two months in solitary confinement before being sent to Marlag O. It was there that he met the journalist Guy Morgan, who was about to be repatriated with serious war wounds, and who smuggled out a number of Worsley's drawings in the plaster cast on his arm. Then came the Albert RN escapade. As allied troops advanced in early 1945, Worsley and other PoWs were forced to march the 80 miles to Lübeck, arriving a few days before the war ended. Returning to Britain, he settled in a small studio in Barons Court, west London. He was asked by the Admiralty to paint portraits of high ranking officers, and found illustration work on the Eagle soon after its launch, painting a full-page advertising/ adventure strip for Walls ice cream, starring Tommy Walls, a lad whose heroics were always accomplished by the Lucky Walls Sign, and whose reward was, inevitably, lashings of ice cream. PC49 followed. In later years, Worsley produced for Esso a series of paintings showing life on oilfields in Iraq and America. He made hundreds of colour illustrations for television readings of children's stories; many of them later found their way into books. Even in his late 70s, he could still be found busy, always working on a marine painting, sculpture or glass engraving. He was a gracious guest of honour at dinners organised by PC49 fans, and impressed a new generation with his collection of wartime sketches, John Worsley's War. Many of his paintings and portraits - including those of Montgomery and Admiral Sir John Cunningham - can be seen at the Imperial War Museum and the National Maritime Museum. He also worked as a police sketch artist, his facility for capturing a likeness being responsible for many arrests. A recent article about his work by one of his enthusiasts was entitled The Complete Artist; nobody earned that title more than John Worsley.